They know which plant is poisonous to put on the arrows, to get the whales. To spear fin and humpback whales, hunters in kayaks threw poison-coated darts with bone heads and points made of obsidian (volcanic glass). Whales died after several days as the slow-acting poison paralyzed their fins or tails, causing them to drown. The poison used was aconite, extracted by soaking and boiling the roots of the monkshood flower. 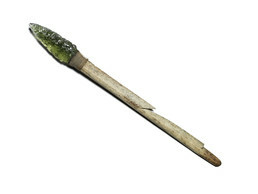 Aconite-covered darts were also employed as deadly weapons for human warfare.